Acknowledged author Stephen Schwarz wrote Fundamentals of Corporate Taxation (University Casebook Series) comprising 801 pages back in 2016. Textbook and etextbook are published under ISBN 1634596021 and 9781634596022. 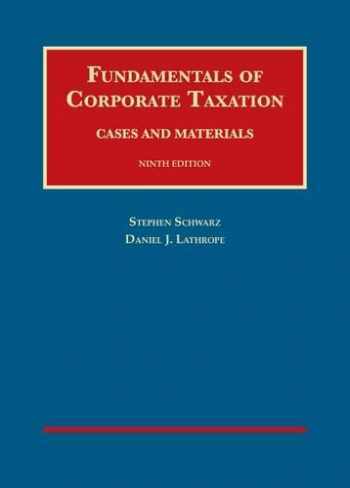 Since then Fundamentals of Corporate Taxation (University Casebook Series) textbook received total rating of 4 stars and was available to sell back to BooksRun online for the top buyback price of $110.00 or rent at the marketplace. The ninth edition of this widely used casebook continues its long tradition of teaching the “fundamentals” of a highly complex subject with clear and engaging explanatory text, skillfully drafted problems, and a rich mix of original source materials to accompany the Code and regulations. Important highlights of the ninth edition include:Coverage of all significant developments since the last edition, including the impact on corporate-shareholder transactions of the now permanent higher marginal individual tax rates and the 3.8% tax on net investment income tax; final regulations on § 336(e) elections and Type F reorganizations; published rulings on internal corporate restructuring transactions; new legislation blocking tax-free spin-offs of REITs and the IRS’s no-ruling policy on certain other types of cash-rich corporate divisions; and S corporation developments.Updated discussion of the options and prospects for fundamental corporate tax reform, including an overview of issues affecting U.S. multinational corporations.Reorganized discussion of the continuity of proprietary interest doctrine in tax-free reorganizations.Expanded coverage of the § 1202 exclusion for sales of small business stock and compensation issues for S corporation owner-employees.Removal of dated and historical materials and more tightly edited cases.